It’s no secret that when it comes to the world of menswear, I’ve got a bit of an obsession with tailored pieces. I dream about suits all day and can’t help applauding a perfectly cut trouser – with just the right amount of break – or a seasonal sports coat that fits in all the right places. The great thing about any piece of personal tailoring is how it can be used to highlight or disguise aspects of your figure whilst still keeping you looking completely put together and dapper. I used to think this of my old baggy GAP hoody, but soon saw the light. However, I think there is one piece of men’s tailoring that doesn’t get as much respect as it should. A piece that, once mastered, can bring a whole new dimension to your look. In case you decided to skim over the title of this article, I’m talking about waistcoats. The waistcoat is capable of transcending social situations and dress codes, yet gives you enough room to experiment with layers and remain stylish. But it seems to me that this humble piece suffers from a bad reputation these days. It’s easy to see why – it’s due to misrepresentation. In the same way that most guys hate the idea of wearing a suit because all they have to go on are real life examples of men wearing suits badly (read: too big), the same applies for waistcoats. It’s not until you see someone killing it that you can appreciate the true potential of an item. It would explain everyone’s obsession with Barney Stinson and “suiting up”. Don’t get me wrong, we’ve all been there. Those days when we thought all we needed to look fancy was a shiny black polyester waistcoat, white shirt and a stupidly skinny tie. Of course, the waistcoat came complete with awful floral purple satin lining and everything. And did we button it up? Hell no! What are you, mad? Got to let that sh*t flap about in the wind and the rain, son. Firstly, fit is king (as always). Make sure it has high armholes, fits snug around shoulders and torso but without there being any pulling around the buttons or the fabric at the back. 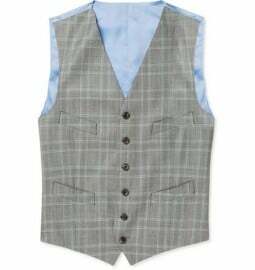 Excess material just makes you look bigger than you are; the whole point of a waistcoat is to help you look more streamlined and tidy. Secondly, always button that bad boy up. It’s supposed to make you look put together, so why would you want it any other way? You’ll just end up looking like a child at a family wedding. However, always leave the last button undone (like a suit jacket) so it doesn’t pull when you lift your arms up. Thirdly, try your best not to look like a waiter. This can be done in three easy steps: one, go for seasonal materials such as tweed/corduroy for winter and cotton/whipcord for summer. This avoids that shiny polyester appearance that looks so tragic in any light. Two, avoid any unnecessary details such as fancy lining or bizarre affectations like pocket watches. You’re a stylish gentleman, not a Steam Punk. And three, simply pair it with items that don’t make you look like a waiter – i.e. anything but black trousers, unless of course it came with them as part of a suit. Really, that’s the best piece of advice I can give you: buy it as part of a suit. Or one that came as an option for a suit, at least. This way you can guarantee it will have a high quality of tailoring (rather than mass production) and it gives you the option of going all out three-piece if you want to at a later date. The other nice thing about buying a waistcoat this way is that they often come with lapels of their own, which when worn without a jacket can add a really nice formal touch to a look. 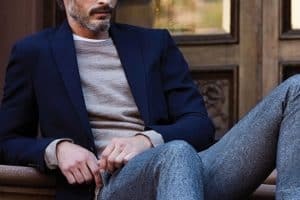 Contrast Tailoring – as soon as the temperature starts to dip, I start to break out the heavy duty suits in flannel and tweed. Waistcoats should be no different. Try and add emphasis to your waistcoat by wearing one in a contrast colour to the suit or blazer that you have on. I like to pair a grey or brown tweed version with my navy flannel suit during the cold months. Finish it off with a blue butcher stripe shirt, grey knitted tie and some brown suede brogues and you’re ready to go. Think Texture – another simple trick is to pair it with pieces of a similar texture. Tweeds and corduroys go perfectly with denim and other wools, so why not try a waistcoat on with your favourite pair of jeans and a flannel plaid shirt in a complementing colour? Alternatively, flip it over and wear it with some grey tweed trousers and a chambray shirt. I also love to layer a denim jacket over my waistcoat to create a play on textures and tone. Layers, Layers, Layers – a lot guys tend to steer away from heavy layering during the colder months in favour of a simple thick overcoat. This is great because it means you feel less bulky and have less to worry about when getting ready in the morning. It is, however, a lot less visually pleasing/interesting. But luckily, this is where the waistcoat comes in. By simply wearing one over your usual dress-down work ensemble of chinos, shirt and tie, you add a point of difference to an everyday look and can still look sharp once the coat comes off. The T-shirt Conundrum – ah yes, this is a tough one. I’m inclined to say that the days of wearing a waistcoat with jeans and a t-shirt are behind us, along with ironic facial hair and thinking The Fratellis were anything other than a flash in the pan. It’s just a very hit and miss look these days. However, what I love to do at the moment is take inspiration from eras when tailored pieces like this were more common – be it old photographs, Boardwalk Empire or films like Lawless and Gangster Squad. With a waistcoat that is made from a more casual fabric such as corduroy, cotton or a linen/wool blend why not try wearing it with a long sleeved Henley top and some worn in denim or chinos? It’s the definition of wearing a waistcoat casually but without looking like a struggling New York rock star because it references history and tradition. If you’re only going to buy one this year, I would recommend a medium grey tweed version. 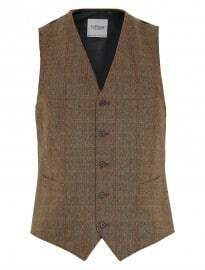 Realistically, you won’t wear a waistcoat that much in the summer anyway, and this one will see you through autumn and winter just fine. Then look to branch out into other colours and fabrics, such as a navy corduroy number or a beige cotton version for the summer. Use it as a versatile layering addition or as a statement piece and you won’t go wrong. But why not tell me what you think? 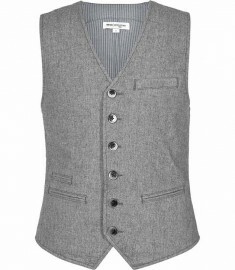 Are waistcoats still a viable addition to your wardrobe or are they underrated for a reason? How would you incorporate them into your wardrobe? Did you actually like The Fratellis? Seriously, Why?